Can young people influence the future of policing? I’d like to start by introducing you to Rialto, a village in Dublin 8, not far from here. While traditionally a working-class community with a population of around 5,000 and with many connections to local industry, Rialto now presents a broader mix including students, middle-class clusters and new international communities. Central to the landscape are two large social housing complexes; Dolphin House and the former Fatima Mansions. Rialto has a strong history of community development, many groups established in the 1980s and 90s as a response to a poverty crisis, drugs epidemic and unemployment among Rialto youth disproportionately high. Rialto Youth Project is a community youth project established in 1981. Jim Lawlor, the manager of RYP is here this evening with me. Rialto is an area that was classified at this time by the Irish state as ‘disadvantaged’. Importantly in the face of the state’s classification of Rialto, the youth project rejects the term disadvantaged’ (which implies no perpetrator) and has instead adopted the defiant language of ‘oppression’ and ‘marginalisation’, naming in its mission statement that the organisation recognises as a starting point that ‘we live in an age of inequality where working class communities are oppressed’. Rialto Youth Project operates on a principle of voluntary participation. That means young people chose to attend, they are not assigned there, not referred there by courts or any other system, and not paid to be there (like youth reach/other training schemes). They attend because they chose to. They engage in projects because they chose to. Since the mid 1980s, the organisation has built a strong capacity for arts-based work, committed to the exploration and representation of social issues. Since 2004, I have been an artist in residence in Rialto Youth Project, drawn to the values of the organisation and their strong relationship with local families. Together we have led projects exploring inequality, primarily in relation to class and gender. The project I will speak about today was a four year project that ran from 2007-11, lead by a collective of young people, youth workers and myself, and began by making a commitment to talk about power. Central to the project was a collection of 60 anonymous stories, gathered carefully in private from members of the collective and a wider group of local young people in response to the question ‘Tell me about a moment in your life when you felt powerful or powerless’. Stories related to family, community, experiences of school and authority were all gathered but the strongest theme to emerge when the collective analysed the stories was policing. This is important, as we never set out to do a project about policing. We asked young people about experiences of powerlessness and the primary theme to emerge was policing. This set in motion a series of events, two of which I will briefly outline. The first was The Day in Question in 2009 at the Irish Museum of Modern Art, a participatory reading event with 26 members of An Garda Siochana in the final stages of their training, all assigned to Dublin South Central District. The event, developed in collaboration with then Chief Superintendent John Twomey and training Sergeant Colm Russell, was built around the reading aloud of a collection of young people’s first person anonymous accounts of policing, by uniformed police officers in the final stages of their training. These readings would take place in a triangular seating plan, (a device that had emerged in earlier works), highlighting the subject positions and contingency of those in the triangle. Participating police officers occupied one side of the triangle, the collective on the second and a group of invited witnesses on the third. The Gardai removed their belts, asps and hats and left them outside the space as a symbolic gesture. The Day in Question, by What’s the Story? Collective, Irish Museum of Modern Art, Dublin, 2009. Video still by Enda O’Brien. © Fiona Whelan and Rialto Youth Project. Young people in this project had expressed a wish ‘to be heard’ by the police and so creating a space for listening became the primary focus. Gardai read aloud and listened to a complex and nuanced collective narrative. There were stories about being repeatedly stopped and searched and the effect this had on ones sense of freedom. This from one young person: ‘I’d say I get stopped about 20 times a month, 20 times a month just for walking around. I’d be walking, and a Garda car would see me and stop and ask me where I’m going. These are all different Guards. By now you’d think the amount of Guards that stop me, they would know my name and where I was from, but they still have to stop me to see where I am going and what I’m doing…I wouldn’t mind if I was in the wrong and going doing things but I’m not. I’m walking places. I’m going to a shop, they stop me. I’m going home, they stop me. I’m going to me mates, they stop me’. There were stories about negative treatment when attempting to avail of a public service in a Garda station, a young person describing the Garda response when refused the use of a pen, the Garda saying ‘I don’t want to catch something off you’. There were personal experiences of police raids on the family home due to a sibling’s suspected criminal behaviour, when the whole family were subjected to degrading treatment, their property left in turmoil. There were stories about being moved on, constantly, having nowhere to sit and be with friends. One young person described how they always see the Garda drive in to the flat complex and ‘search kids and search the wrong people’. There is nowhere else to go. Life becomes a process of being moved on. Naked, squatting, humiliated, the young person describes it: I felt it was really disgusting. There was a story about being arrested and taken to the station to be strip-searched, a response clearly disproportionate to the event which sparked the arrest. Naked, squatting, humiliated, the young person describes it: ‘ I felt it was really disgusting…He knew that I had no idea what was going on… Any time to this day that I see him, he just smiles when he sees me, knowing that. He just looks at me and starts smirking. I just feel disgusted’. When asking the Gardai to read these stories, and listen to them, we also included other relevant life experiences in the readings such as one young person’s desire to be a Garda, another describing living with a brother with a drug addiction. This was not black and white but a complex collective narrative. Interestingly young people were not painting themselves as saints all of the time and they understood the difficulties of policing an area which clearly had a drug dealing issue, but they asked simply to be treated with more dignity and respect. As Dr. Aogan Mulcahy of UCD pointed out when later analysing many of the stories, the words used ‘do not depict the young people themselves as “tough”; in fact the stories repeatedly talk about the embarrassment of being subject to police action’. As one story relates: ‘It’s so embarrassing emptying out your pockets and getting searched in your own area’. As Mulcahy notes, the storytellers use words like ‘”anger”, “fear”, “hatred” and there is “shame”’. While there were stories of physical action and coercion, one of the striking things Mulcahy noted was the words and feelings – ‘in particular the concept of recognition’ and ‘the perceived lack of respect’, as one young person explains: ‘I feel so small, not even good enough for the dirt underneath their feet,’ and another: ‘We are not shite. They treat us like we were nothing’. In summary, in these stories, for the most part policing was experienced as a humiliating ordeal. There is no recognition here that young people have a right to exist in public spaces, to have freedom and personal liberty to walk in their city. As Mulchay notes, these young people’s marginal status is confirmed in that ‘they expect to be considered a problem for the police’, they are repeatedly profiled, being regarded less as people to be protected than as suspects to be questioned and monitored. This of course contributes to a cycle of distrust in police. Through this event, young people bravely shared their experiences anonymously. The Chief Superintendent was responsive to the young people’s accounts and opened the doors for this encounter to happen, and Gardai participated by listening, hearing about how young people’s experience of policing affected them in their lives. Conversations opened, where new insights could be gained by all. Do you ever say sorry if you stop and search a young person and you find that they have done nothing wrong? In a commitment to pursuing this enquiry, one year later, having reflected upon the The Day in Question (2009) event with all involved, we advanced the enquiry towards another more public iteration. Policing Dialogues (2010) was a six-week exhibition and residency at The LAB gallery, Dublin led by the same collective. The gallery became an active dialogical space intending to publicly examine police and young people’s relations. Workshops, seminars and media engagement were a weekly experience. Policing Dialogues, by What’s the Story? Collective, The LAB, Dublin, 2010. © Dublin City Council Arts Office. familiarity with communities, while issues with training and other factors emerged. New understandings were reached on a personal level for many involved and diverse insights were gathered by a core team. 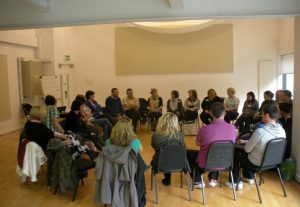 These insights, plus the original stories and feedback from other events were fed into a weekly training inquiry held after hours in the gallery (on a triangle), with a representative group of young people and youth workers from RYP and Gardai, Sergeant and new Chief Superintendant Michael O’ Sullivan who collectively explored how best to incorporate awareness of power, dignity and respect into relationships between Gardai and young people. The process jointly explored the current structure, organisation and training of Gardai, the relationship between young people and Gardai and how best to mutually enhance community policing. Policing Dialogues, by What’s the Story? Collective, The LAB, Dublin, 2010. © Fiona Whelan. Two training modules were co-developed and agreed during this process to address agreed gaps in the national training programme for Gardai. 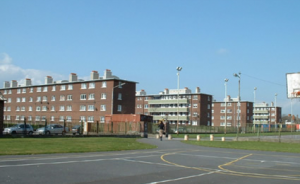 As per the press release of 5 December 2011, these modules were to be delivered at a local level as part of an induction to new Gardai assigned to Dublin south central, and focused on ‘understanding young people’s behaviour’ and ‘understanding areas of urban “disadvantage” and poverty’. As people will know, the Garda training college closed soon after that. In 2015, when it reopened with a new BA in Applied Policing, myself and Jim Lawlor re-initiated contact with the new Chief Superintendent Frank Clerkin (now our third Chief Superintendent to engage with) to discuss the implementation of the agreed training programmes now that there were new recruits being assigned to the district. Chief Superintendant Clerkin supported a series of meetings, one of which took place in Templemore. I don’t have time to explain the story of each meeting since, but to say that the energy for the process now feels largely one way, and following some internal meetings in An Garda Siochana in 2016, there have been no developments. We appreciate that An Garda Siochana have bigger issues in the last number of years, but the process at the core of this project was highly collaborative, innovative, careful and inclusive, producing real ideas for training that could be mutually beneficial and make headway in humanising the other, breaking cycles of discrimination against youth in this city, that continue to exist. We know this process has something more to offer. In the years since the project, we have been contacted by some individual Gardai from around Ireland wanting to know more about how we worked; by journalists researching policing; by a cross border research project ‘New Foundations in Youth Justice’ in 2017 which focused on young people’s rights and experiences in the youth justice system, in order to better inform policy and practice; by the Children’s Rights Alliance as part of a recent process with the policing authority, and now the ICCL. Meanwhile, young people continue to come into Rialto Youth Project with stories of negative and humiliating experiences of policing. We really want this to change and so we really welcome the ICCL submission to the Commission on the Future of Policing. In a report calling for radical reform of the entire system of policing in Ireland, the Irish Council for Civil Liberties (ICCL) has called for human rights to become the cornerstone of the current process of reform of An Garda Síochána. The report, entitled “Rights-based policing: How do we get there?” is ICCL’s submission to the Commission on the Future of Policing in Ireland, which has been gathering ideas from all sectors of Irish society as to the direction and nature of reform. Rather than focus on what it refers to as “the many human rights abuses committed over the years”, or any of the various crises besetting the force at the moment, the ICCL submission looks to the systemic changes needed to overhaul Irish policing. “We are of course more than aware of the problems dogging the Gardaí, and the outstanding issues which require just resolution. However, we focus here on the underlying structural issues which have caused these scandals and human rights abuses to recur. The message of our submission is that a process of reform directed at cultural change within the Garda must be undertaken, and that this process must be underpinned by clear and enforceable human rights standards and guaranteed by effective and resourced oversight bodies. Our submission sets out the case for holistic and radical reform of all levels of policing – changes in law, changes in oversight, and changes in culture. The lesson of the last 20 years is that reform in individual areas of policing or reforms which omit either Garda culture or systems of legal enforcement will be partial and unsuccessful. “As an example, we call for better legal protection for the rights of suspects, including access to a lawyer during interview, as well as calling for an investment in human rights training of gardaí who conduct interviews. Such approaches have led to significant change in many European countries and legal safeguards of this type would have prevented many of the worst cases of Garda misconduct over the years. The submission echoes recent reports by the Policing Authority and GSOC in stating that the current architecture of Garda oversight is cumbersome and ineffective. It calls for a “thorough review of the relationship between the Policing Authority, the Minister and the Department of Justice, and An Garda Síochána”, as well as for better resourcing and more powers for GSOC. In doing so, it acknowledges that efforts for reform have been many and genuine over the past fifteen years, but suggests that, rather than taking a trickle-down approach to reform, human-rights based reform should take place at every operational level. The report refers to the Patten process, which reformed policing so radically in the North, as a roadmap for this radical vision for change. “The last set of recommendations, on changing the culture”, said Mr. Herrick, “are crucial in that none of the other recommendations will come to fruition without the buy-in of every level of the organisation, the Department of Justice, and politicians. We are at a key moment when the political will for change appears to be real and the public demand for action is deafening. We think that with proper resourcing and education, much needed radical reform is entirely possible. The report will be launched in Dublin tonight, at an event which will be addressed by speakers from the Commission on the Future of Policing, GSOC, the Policing Authority, the Garda Inspectorate and An Garda Síochána itself. Rights-Based Policing: how do we get there? The Irish Council for Civil Liberties (ICCL) welcomes the establishment of the Commission on the Future of Policing in Ireland, having long campaigned for the overhaul of laws, structures and practices concerning policing in Ireland. Indeed, ICCL’s establishment in 1976 was a reaction to proposals for extensive emergency powers legislation and allegations of systemic mistreatment of suspects by an identified group of Gardaí who were referred to as “The Heavy Gang”. Over the intervening forty years, Garda reform has been at the heart of ICCL’s work. We campaigned for the establishment of the Policing Authority, the Garda Síochána Ombudsman Commission and the Garda Inspectorate as necessary oversight bodies. Policing was a common thread throughout our early and subsequent campaigns challenging emergency powers; our work defending freedom of association and assembly; and our participation in national debates on immigration, gender violence and respect for private and family life. In short, issues about An Garda Síochána have always been centre stage in Irish human rights discourse. Now it is time to move human rights discourse to centre stage at An Garda Síochána.